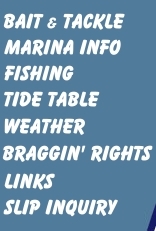 Since 1936, Shaffer's has been supplying fisherman with all the means to land you some fun on the water. Rods, reels, all kinds of bait, and every piece of tackle you'll ever need. Bring your trailered boat for the day, and launch on site. You say you left your sea legs at home? Enjoy a newly restored, handicapped accessible fishing platform, adjacent to the marina. Safe, ample parking, bait, ice, snacks and honest advice.